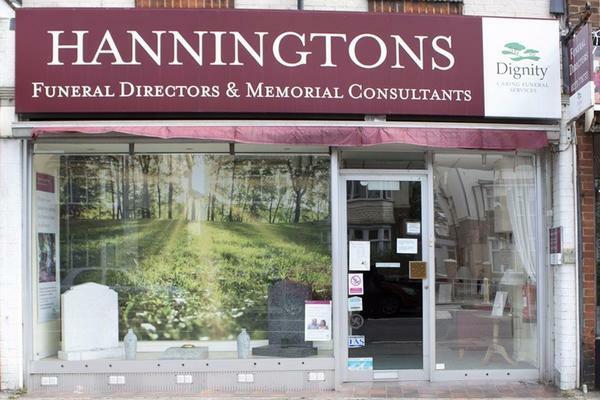 Hanningtons Funeral Directors in Hove provides the local East Sussex community with a high quality service, arranging funerals for families who have experienced loss. We are here to support you at this difficult time. Speak to our caring team to arrange a funeral for your loved one. Here at Hanningtons, we place your needs first. The team at our funeral directors is available to offer you comfort, along with guidance and advice, and will try to help ease a little of the emotional upheaval you may be experiencing. Whether you choose a religious or a non-religious service, a traditional or a contemporary one, your loved one’s funeral will be tailored in accordance with your wishes. That way you can rest assured your family and friends will be able to remember your loved one in the manner most personal to you. The Hanningtons name was established in 1849 and we were the funeral division of the famous department store in Brighton. The funeral care experience we have gained over the years has been passed down through the generations and means you can be confident that both you and your loved one will be treated with absolute respect and integrity while in our care. Throughout our time here, we have had the honour of serving a wide variety of faiths and cultures, including the local Coptic Christian community. Previously based on Montefiore Road, we moved to our present location on Old Shoreham Road in 2006. From here we are easily accessible to all of Hove, such as Aldrington, Brunswick Town, Hangleton and Portslade. Our funeral home also has a chapel of rest, which is available if you wish to spend time with your loved one. If it is more convenient for you and your family, the team at our Hove funeral directors can open this outside of normal hours. When you get in touch, there is always somebody ready to listen, no matter what time of the day or night. To arrange a dignified funeral for your loved one, call us today. Call us today on 01273 778733 to talk through your personal requirements. At Hanningtons Funeral Directors, we understand how special life is with those that you love. For us, every funeral is unique and personal. We have a service to fulfil every wish, with every detail carried out with the same uncompromising quality of care. From a traditional service, to a colourful woodland burial, your options are limitless with our Full Service Funeral. If you have a little more flexibility when it comes to arrangements, then we can provide a Simple Funeral for a lower cost. We are opposite the Hove Park Tavern, on the crossroads of Old Shoreham Road and Sackville Road. Our staff are available 24 hours a day on 01273 778733 if you require our services outside of these hours.